For the 14th year, Sam Houston State University will highlight the music and culture of Fat Tuesday during the annual Cajun Mardi Gras Festival on Thursday (Feb. 5). The early celebration (Fat Tuesday is Feb. 17) will include a symposium on Mardi Gras and Cajun music and culture, as well as the annual Mardi Gras dance. The symposium, which will begin at 6 p.m. in Evans Building Room 105, will feature a panel discussion with Jambalaya Cajun Band members Terry Huval and Reggie Matte, Cajun music hall of fame member and Grammy nominee D. L. Menard, and moderator and Cajun historian Terry Thibodeaux, professor of communication studies at SHSU. The group will discuss the history of the Cajun people, its music and the tradition of Mardi Gras. The symposium is open to the public, who is encouraged to ask questions and participate. That evening the five-member Jambalaya Cajun Band, from Lafayette, Louisiana, joined by Menard, will play a traditional dance in the “fais do do” style during the Cajun Mardi Gras Dance, from 8-10 p.m. in the Estill Building Atrium. “The ‘fais do do’ style has chairs around the edges of the room and dancers wind their way around the center as they dance in the traditional counter-clockwise pattern found at any Cajun dance anywhere in Louisiana,” Thibodeaux said. 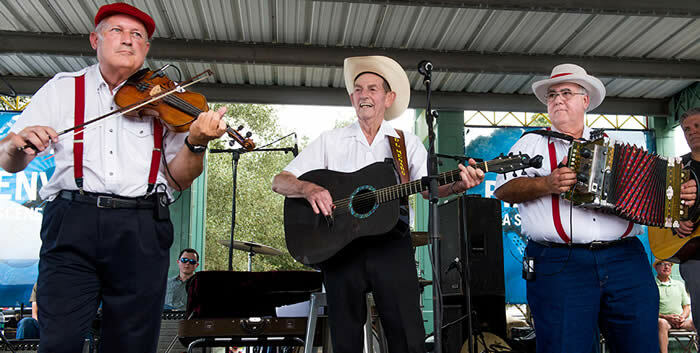 “Regulars at the SHSU dance are happy to show rookies how to do the Cajun version of the waltz and two-step,” he said, “and dancers often find themselves dodging not only other dancers but also Terry Huval as he occasionally plays his fiddle amidst the dancers. For more information, contact Thibodeaux at 936.294.1356. In light of the recent events in cities like Ferguson, Missouri, and New York City, police across the country are facing criticism over use of deadly force. Radley Balko will discuss the “Militarization of Police Forces” on Tuesday (Jan. 27) from 11 a.m. to 12:30 p.m. in the Hazel B. Kerper Courtroom for the College of Criminal Justice’s “Liberty and Security” speaker series. Washington Post reporter Radley Balko will discuss the changes in police weaponry and tactics, which have been criticized for being unnecessarily militaristic, as seen above. Balko, a reporter for the Washington Post, is also the author of “Rise of the Warrior Cop: The Militarization of America’s Police Forces,” which documents the changes in police weaponry and tactics over the history of this country, from early colonists to today’s SWAT teams and special response units. “Under the auspices of the war on crime, drugs and terrorism, policy makers have approved aggressive methods of policing, which are leading to unnecessary deaths and injuries, blurring the lines between police officer and soldier and decimating the Fourth Amendment,” Balko said. He has testified twice before the U.S. Congress and his reporting has been credited with helping to get Cory Maye off of death row. "Recently, in the Ferguson case, we have seen both the heavy-handedness of the militarization of the police, as well as its need,” said Willard Oliver, assistant professor of criminal justice at SHSU. 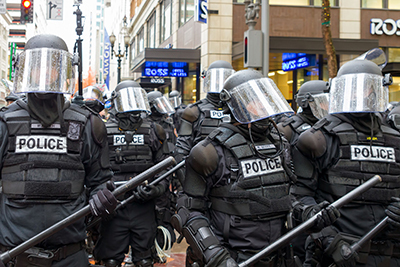 “It is well time we had a conversation in America about the militarization of the police. Radley Balko is at the forefront of this discussion and he is coming to start that conversation." Rice University post-doctoral research associate Jason Nguyen will discuss his research on matter-wave solitons and the discoveries his team made in a study that was later published on Thursday (Jan. 29). The SHSU physics department’s Physics Colloquium presentation will begin at 3 p.m. in Farrington Building Room 209. In the study, titled “Collisions of Matter-Wave Solitons,” Nguyen and his team found that when dealing with ultracold matter, results may produce an important new idea that was previously unknown to the physics community. Solitons are non-dispersive waves that have been observed in many wave phenomena, such as the motion of water waves in narrow canals and light pulses in optical fibers. When Nguyen and his team began their study, they noticed that while solitons are supposed to pass through one another, some seemed to bounce off of one another. Looking for a change of scenery? How would you like to learn more about your field of study, in a country in which your discipline directly applies? SHSU’s Office of International Programs will provide interested students with all the information they need to study abroad through presentations beginning Tuesday (Jan. 27). Study abroad coordinator Cassie Cure will discuss the options of studying abroad through faculty-led, exchange and independent programs from 4-5 p.m. in Farrington Building Room 101. Sessions will also be held on Feb. 4 and Feb. 12. The session will also include an overview of study abroad scholarship options, safety while abroad, and application and payment deadlines. There also will be a question-and-answer portion during which time students may ask questions, and returning SHSU study abroad students and exchange students will be on hand to share their experiences. The majority of students attend faculty-led programs during summer or winter break. Though they vary each year, the 2015 summer programs include foreign language courses in France, Spain and Costa Rica; biology in South Africa; chemistry in Germany and France; art in France and Italy; business in Japan; education in Europe; and more. Through exchange programs, students typically spend a semester or a year abroad, and they attend classes taught by the host university but pay tuition and fees to SHSU. SHSU currently has exchange partnerships with 21 universities in 13 different countries, including Albania, Chile, China, Finland, France, Germany, Japan, Mexico, Netherlands, Peru, South Korea, Switzerland and Turkey. With independent third party programs, students can go for the summer or semester and typically select from one of six affiliated study abroad companies (API, AIFS, KEI, ISA, SOL Education Abroad, and JLI) or, with approval, can choose another program. All payments are made to the independent program and students receive transfer credit for courses. Between the three types of program options—faculty-led, exchange or independent—International Programs offers a program for any major, although some are more limited than others. For more information on any of these events, contact Cure at 936.294.3276. Since President Barack Obama’s recent announcement to improve relations between the United States and Cuba, many are expressing thoughts and opinions of what Cuba will be like if the embargo is lifted. Rafael Saumell-Mu�oz will discuss the implications of the United State's announcement to lift the Cuban embargo. 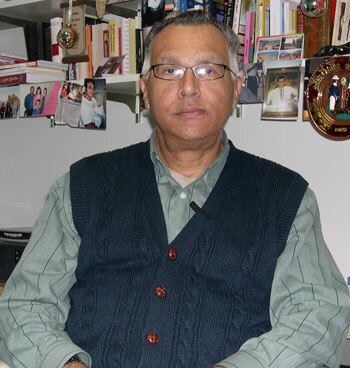 Rafael Saumell-Muñoz, professor of Spanish at Sam Houston State University, will participate in “Imagining Cuba in a Post-Embargo Era: Ideas from the Cuban Diaspora in Texas,” a panel discussion, at the University of Texas at Austin on Jan. 30. The discussion will bring together members of the Cuban diaspora in Texas to share their views, hopes and reservations about the coming changes. The panelists joining Saumell-Muñoz include: Mabel Cuesta, assistant professor of Spanish Caribbean literature at the University of Houston; Michael Hernández-Miranda, graduate student and Spanish instructor at Texas A&M University; Martha M. Montejo Pizarro, doctoral candidate on Hispanic Studies at Texas A&M University, journalist and editor; Francisco Morán, associate professor of Latin American literature at Southern Methodist University; and Jorge R. Piñón, interim director of the Center for International Energy and Environmental Policy in the Jackson School of Geosciences at the University of Texas at Austin. A Cuban native, Saumell-Muñoz was imprisoned in his homeland after it was discovered that he had written an unpublished collection of short stories that were deemed as “enemy propaganda” by the Cuban penal code. When he was released from prison in 1986, he applied for an American visa and eventually became a graduate student at Washington University in St. Louis, Missouri, where he completed his doctorate. 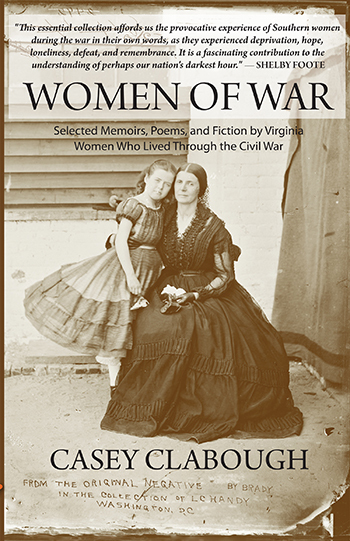 While there are many accounts of the quality of life during the Civil War, there are few that embody the true suffering and sacrifice of the wives and children of soldiers such as those in “Women of War: Selected Memoirs, Poems, and Fiction by Virginia Women Who Lived Through The Civil War,” according to a review by Wayne L. Wolf, professor emeritus at South Suburban College. The review appeared in Civil War News. The book, published by Texas Review Press at Sam Houston State University, was compiled by Casey Clabough, and consists of a selection of passages from previously published works, divided into memoirs, poems and fiction by women from Virginia. Poetry selections from Makgabet Figoot, Susan Archer Tally and C.A. Ball all deal with Southern honor, in the context of death, loss and grief. “Women of War” is available for purchase through Texas Review Press, or at tamupress.com.